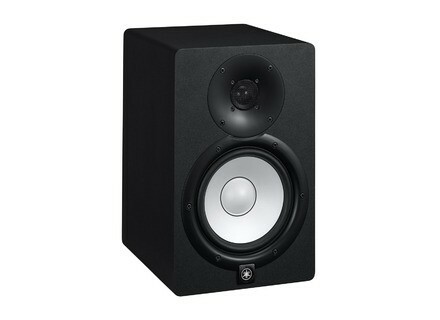 HS7, Active Monitor from Yamaha in the HS series. 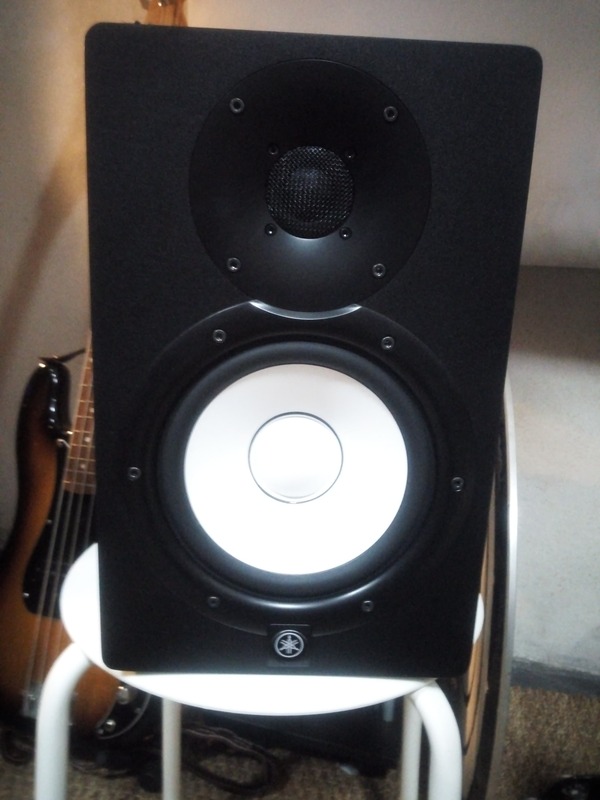 Germilaroch's review (This content has been automatically translated from French)" The tools for a perfect listening"
These two monitor speakers voices are small (210 × 332 × 284mm, 8.2 kg), I use the output of a PC sound card via a Komplete Audio 6 from Native Instruments. 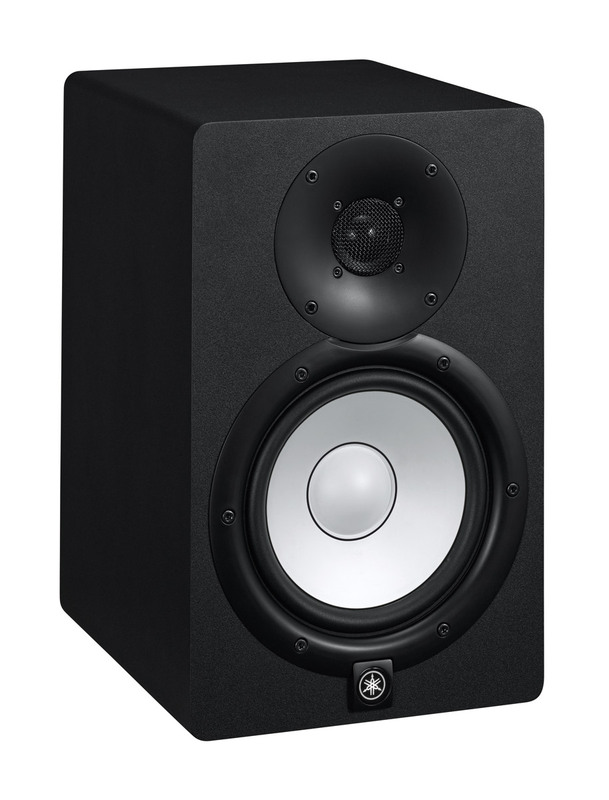 The 6.5 boomeur "white gives the characteristic of Yamaha button, the bass reflex vent is located at the rear of the enclosure. Course, if your system allows it, you must use balanced cables (XLR or stereo jack) to preserve the purity of the sound. The stereo image is precise and the sound spectrum, balanced (despite a listening room a little resonance in the low frequencies). The mids and highs are very clear. Restitution is correct at low frequencies above 60 Hz, but my listening room has no acoustical treatment to better judge. The price / quality ratio is very good and after 3 months, I do not regret my choice. I appreciate the opportunity to be able to adjust the gain in the low (control room: 0, -2 or -4 dB) and treble (high trim +2, 0, -2 dB). I would, too, preferred a interuptor front rather than the rear. jjdin's review (This content has been automatically translated from French)" Almost perfect"
Le Garage Studio's review (This content has been automatically translated from French)" Nice surprise"
So I say to the next level of nullity, take the HS7, new flagship of the range, so I vérifirai my mixes in new speakers. Well, remember all the same price: 400 €. So for neutrality, we will return with a little more liquidity. Effective respect of the stereo image, even at close range. Dynamic hair. In short, look at my overall opinion. Well then, I bow my head. These speakers are the surprise of the year. They are really excellent in this price range. They absolutely do not struggle in desous of 100hz, as I have read, and restore sound to about 60hz before crashing like big turds short of that frequency. They are not made for working subs, sure, it's 6.5 inches. But they have very nice bass, well-rounded, and make fishing with some good attacking kick drums. They have beautiful mediums purposes and treble surprisingly enjoyable when you know Yamaha. Great effort. They even render pretty good reverbs, even at low level. No, really, it's not Neumann, but they are really impressive in this price range. Anonymous 's review (This content has been automatically translated from French)" Superb!" I used for the composition but also the mix. I have 2 weeks. I put 9/10 for the simple reason that there is always best but five times the price. This pair listening 400 euros and for the price you can not find better. What is notable about this new range hs this is the fact that no lon tiredness longer listen to them. There is more that sound harsh to see a little too sharp stinging quavaient older models HS50 or HS80. However, the new models retain their caractérisque at mediums who wish to make crispy and very revealing to the mix of voice, for example, but without being tiring either. The bass on these HS7 is more than reasonable. Some complain constantly low on older models but I think this is very well balanced and even my hand doing hip hop this is enough. In fact some people are constantly in search of more bass in the monitor speakers but often it mixes who suffer because even sil is true that not enough bass can affect the mix too well, and then they are other frequencies drowning in the mass. So very good balance of all frequencies to the mix, a hundred times better than krk blesses everyone in hip hop then what is good for the composition and in any case to the mix. So if you had the HS50 you'll finally have low do you need with these HS7. 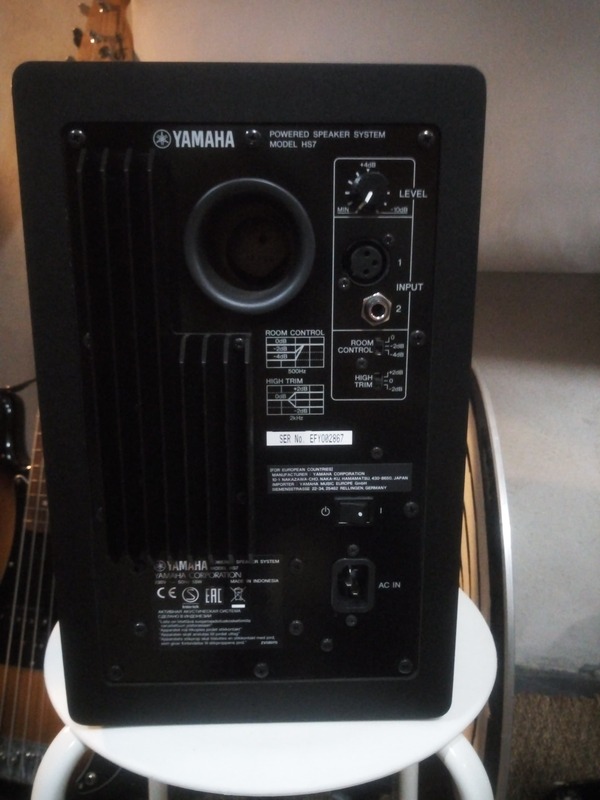 These Yamaha HS7 are real small bijours for price once again. 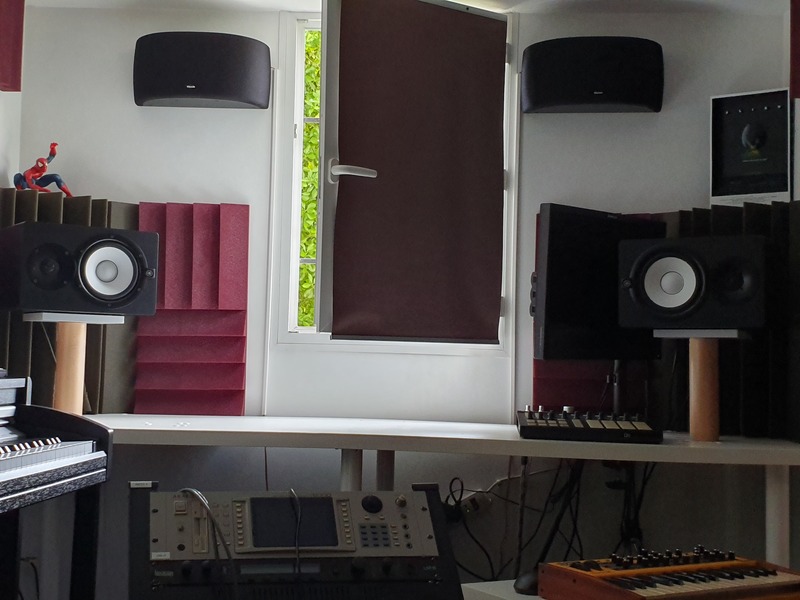 Jai compares and had several sets before denceintes (Focal CMS50, Yamaha HS50, Genelec 8020A, Neumann, adams etc etc) and I find them much better than some monitors that javais pay 1000 euros a pair. The only thing I do not like this is always the switch at the back of the speaker system but hey this is a more practical dimension ca does not affect to the quality of the speaker system. 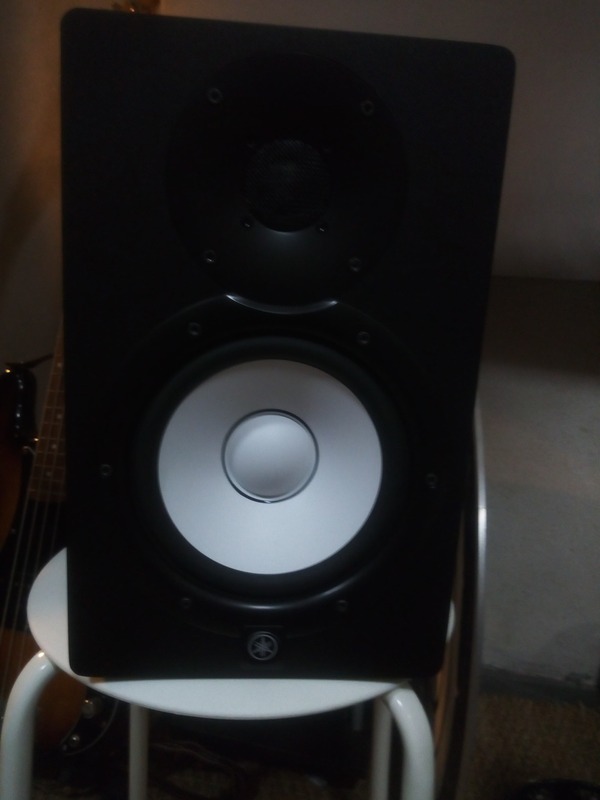 If you have a production office, or any other surface I dinvestir adviser you in a pair of IsoAcoustics ISO L8R155 a goodly price was 100 euro the pair but this is a hundred times better than the accoustics foam to isolate the surface or you have posed. Pregnant then become even more magical!! I recommende two hundred percent in HS7 yamaha!! I have also tested the HS8 and I am born not seen est to 125 euros more. Also it is worth noting that for untreated home studio or small see through it will be very hard to do better than these speakers at dune faithful sound reproduction, the HS8 in this case that may be too low and the boom naurait walnut effect your mix if you do not low accosutiques traps or other treatments.